Extremely limited availability of first (air freighted) batch. Now rated for up to 140mm forks. and a bottle cage and framebag.. The bikes are custom, so you can choose a 38mm rise alu or 40mm rise carbon bar. Add some spacers. Done. I like it, but I wish they had widened the rear end just a little. 29×2.6 are the bestest. Why didn’t they put the extra bottle cage mount on seat tube like most other folks? I don’t really want to put a bottle down there unless I really need the extra capacity. Also, if you wanted a rigid fork on there, can you get one long enough to make the geometry work? Why didn’t they put the extra bottle cage mount on seat tube like most other folks? Because you’d be limited to a short dropper post. This way you can get a 170mm dropper no problem. I love the look of low stack, high rise bars. Not enough companies make 780mm bars with a 50mm rise. Renthal go up to 40, I think. I run the Spank 800mm 50mm vibocore riser things. Look ridiculous but I don’t care. I’m running Renthal 40mm riser bars on my FlareMax. Looks (and more importantly feels) OK to me. Worka components do one. It’s an external upper cup and basically slams the top of the steerer as far back in the headtube as it can. That reminds me… fitting an external top cup, with increased stack height over the internal one normally fitted in the 44mm headtubes of Cotics, is yet another way to get those bars a bit higher, if that’s your predilection. As a couple of us, at least, have been asking / shown interest in this. Would you be able to do an update on how this rides? Like I say, I’m at 120mm on mine and although it slackened the seat angle too, that hasn’t been a major issue. But seeing as slacker seems the way, it might be an idea I’d try before getting a mk4. Answer protaper bars go up to 76mm rise if you want more height. I’ve just compared the geometry to my current bike. It’s not as radically different as i was hoping. 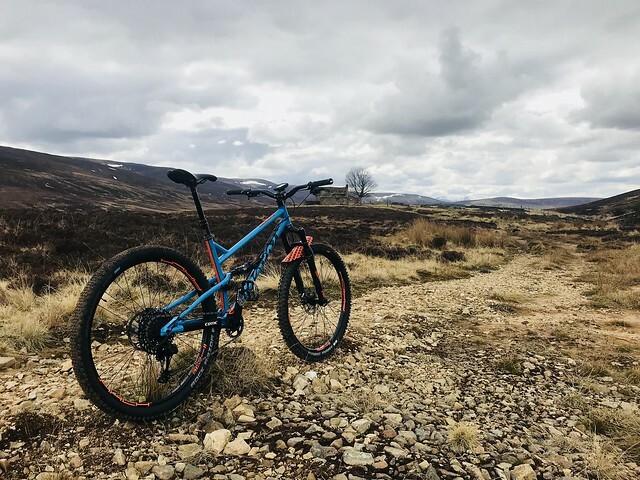 I bought the Whyte to tie me over as a cheap winter HT, but it actually turns out to be superb. I’ve been waiting for ages for this to replace it. It looks fantastic and is a step in the right direction, but I do wish they pushed some of the numbers a bit more. Currently running a 50mm stem on the Whyte, so a 35mm on the Cotic gives the same reach and SA/HA are the same. Longer stays is a negative in my book. Suppose the only way to tell is to test ride and decide if it’s £400 better than my frame. Also not a fan of the cable routing. Did you not consider that the short seat tubes on the new Solaris mean you can size up if you want an even longer bike? Also, that isn’t sagged geometry for the Whyte, it’s static. 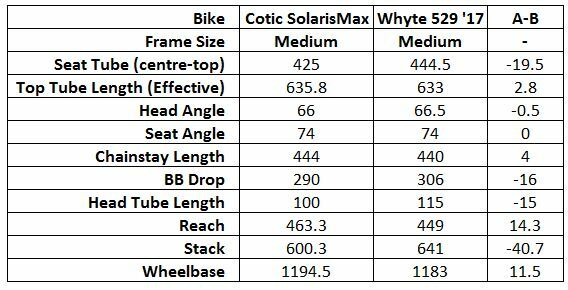 You can see that if you compare photos of the bikes – the angles on the Cotic are slacker and the Whyte doesn’t have a 15mm higher bottom bracket or 40mm more stack height. Goes to show how confusing only supplying sagged geo is, as some people will still compare it to other bikes static numbers. Solaris looks great btw, although I prefer the seat stay detail on the small compared to the mini wishbone on the others. The geo looks good. I had one of the Solaris Maxs from last year and it was great but too short. I’m on a SC Chameleon now which is awesome. The Solaris chain stays are still too long on this update. I found a huge improvement in cornering when I switched to the Chameleon with 415mm chainstays. Whyte aren’t particularly clear on how their geometry is measured, but it appears you’re right and it’s measured unsagged! Why can’t they just make it clear… (Stack is straight off their site and BB height was a conversion). If that’s really the case, then I think I’ll get one. Who has kidnapped cokie and replaced them? Imposter! 藍 A quick look at the FlareMAX geo would tell you what was coming… numbers are only numbers, proof of the pudding and all that. I knew my Sherpa was too short as soon as I sat on it (but it looked bob on ‘paper’) and that’s why it’s getting changed now. Sat on my mates FlareMAX the other day so know the reach is within the adjustment rails of the saddle (and the further forward, so prob better). So glad I didn’t go down the custom frame route as I would have royally **** it up.if your Whyte is ‘superb’ why change? 415mm chainstays? Is that a 26” wheeled bike?  I’d suggest stay length partly for tyre clearance (up 29er 2.5”) is going push you back. And that Cotic have reasons for lengthening it on this iteration. id better go settle my bill (and order up the missing odds and ends) or else I’ll not be getting my frame/forks next week…. Looking forward to seeing your build Metalheart. Do you still have your mk1 as well? Whyte’s great, but I’ve always fancied a Cotic and something steel. Didn’t realise the numbers would be so close, but turns out they’re not. Green one for me then! Will keep the Whyte in case it doesn’t work out. i had a tough decision on the colour, the fact that I already have a green one and I needed to make my mind up quick before they went live. Glad the photos leaked to give me time to consider! which made the choice difficult this time. 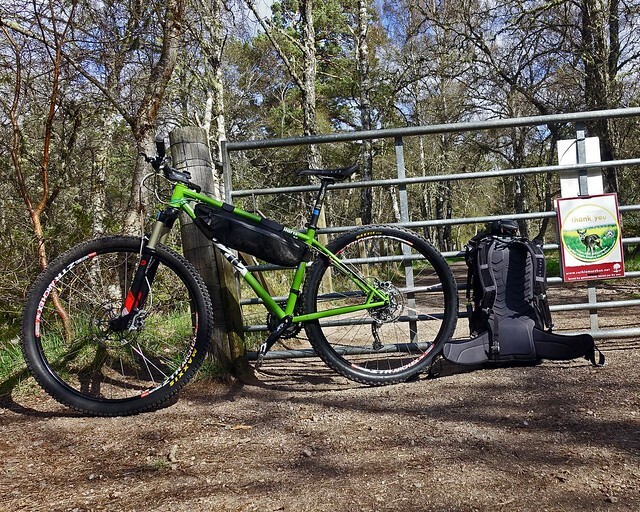 Cokie – as a matter of interest what size of tyre can you get on the back of the Whyte? Admittedly, I did move them out a bit to run my 29er 2.5 wheels in the winter. Hmmm, I was hoping this wouldn’t tick all the boxes. On the other hand it’s £200 more expensive than a Nordest Bardino and has a paltry 2 year warranty. The Bardino is quite a different beast though, isn’t it… not 853, about a pound heavier, longer travel… it is cheaper by a fair chunk, because of the use of cheaper tubing, but I don’t recall it being anywhere near £200 cheaper. They look like a riot though… and, personally, I love that colour scheme. @andykirk , I’ve got a HR2 2.3 in the back with about 12mm space either side, so not too bad. Zero issues in the mid this year. Not bad for a 135xqr rear end. Rode the LS Solaris with Sam today at Gisburn. No doubt a cracking bike. The cosmic black paint job is stunning. Also really like the Soul. Might have to sell a Kidney. Yes, some of the materials are different. Regardless of whether it’s 100 or 200 quid difference in price the difference between a 2 and 5 year warranty is considerable. Hey guys, glad you like the look of the new bike. Just to answer the question, the chainstays are that long because in my opinion it works between with the geometry in terms of balancing your weight out between the wheels. With a longer rear end the bike climbs better, and in my opinion, turns better. It naturally puts more weight on the front of the bike, which is what you need with the longer front end. If you prefer shorter stays, that’s cool, there are plenty of other brands offering that. Regarding tyre clearance, we have some new 29 x 2.6″ tyres coming fairly soon and I am pretty sure they will fit. However given I know that 2.5’s fit I have gone with that for now. On warranty we offer 2 year free followed by 2 years half price replacement for workmanship and materials defects. People generally have very little call on either of these, and even when they have if you give a bit of a search on here you’ll probably find we tend to over deliver. We’re 100% behind our product and our customers. Ordered. Dark metal and some orange hope bits. Will run 130mm Pike to start and go from there. Its going to be a long months wait..
Cooke that’s the colour combo I’d go for, if things improve with wife’s health I’ll be ordering one.